There’s nothing quite like sitting by a wood stove or an open fireplace to take the chill off as the days grow shorter and the temps fall. Perhaps you also get satisfaction from knowing that burning wood is displacing use of expensive heating oil or propane. But did you also know that you could inadvertently be introducing invasive insects to Lake Buel’s shorelines? It’s true if you ‘import’ firewood. The beautiful forests surrounding our Lake are under assault from invasive species. Common threats include woolly adelgid killing Hemlocks and the Asian Longhorned beetle and emerald ash borer insects attacking hardwood trees. Already woolly adelgid is ravaging eastern MA and metro New York, and Asian Longhorn beetles are prevalent in sections of Worcester County, MA and have been sighted in Brookline and Boston. With its initial infestation point most likely Brooklyn, the Asian Longhorned beetle has since spread throughout metro New York City including New Jersey. Even Central Park has not been immune! It has been described as the most destructive non-native insect in the US. What can we do? Be very careful about buying firewood. Know where it is sourced, and insist on buying from reputable local firewood dealers. And be very skeptical of buying bargain firewood in areas where the Asian Longhorned beetles are prevalent. 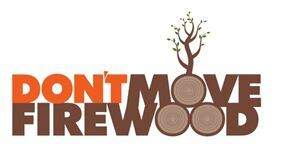 Don’t inadvertently accelerate the spread of invasive species by “importing” diseased firewood to Lake Buel. Buy local! This entry was posted in announcements, ecosystem, wildlife by Chuck Pierce. Bookmark the permalink. This morning (9/13/2012) it was reported that the emerald ash borer insect was discovered in Dalton – Berkshire County marking its first “official” appearance in Massachusetts. MA is the 18th state reporting infestation since the insect was first discovered in Michigan about 15 years ago. Since then it has destroyed millions of ash trees, a valuable hardwood that resembles white oak. CT and NY have already reported emerald ash borer insects within their borders. How was it discovered? Those purple box things you see suspended in trees along some Berkshire roads are actually insects traps.